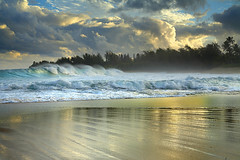 As the sun rose, a storm brings big surf to the north shore of the island of Kauai. In the winter, large waves break in portions of Haena Beach that are not protected by the coral reef. This one is over 10 feet tall from its base. They can get even larger during large winter storms. This was a rather tricky shot to get right because so many things were happening in a chaotic order. But I wanted to show all the best things happening at once. After every shot, I had to run, as I planted the tripod right in the path of the waves to get the closest view. Standing back on the dry part of the beach makes the action look distant, even if you zoom in. It is more dramatic to use a wide-angle and get close! These waves looked best just before the break, as the light penetrated through them. The sand glistened and moved for just a second before drying up, so timing was important. See my notes on the image.